The second of Mornington Peninsula Brewery's New England style IPAs, Squid Rising, has a strong claim to be among the very best beers of the style brewed in Australia; indeed, our Best Beers Of 2018 – So Far placed it equal first with Balter's IIPA. 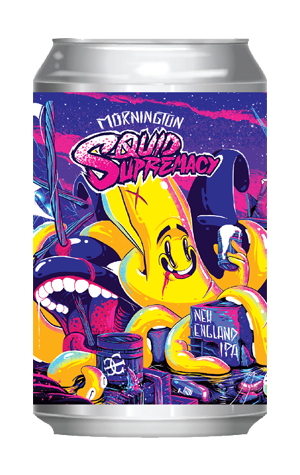 So, what of Supremacy, the brewery's third and biggest such beer, complete with artwork that sees said squid rampaging through Melbourne with a look of glee and the tagline: "The Squid to end all Squids"? Well, it's got a strong claim to be among the very sludgiest beers of the style brewed in Australia; it's not quite custard in appearance, maybe semolina after it's been put through a strainer. It even seems to swirl more slowly in the glass, as if the suspended particles are adding inertia. It's faintly boozy on the nose (and noticeably so once you've finished a can), sharply tropical and stone fruity in terms of aroma and flavours, lightly carbonated and reasonably bitter. Hop gazpacho?